10 bars of chocolate in 10 different flavours. Wow. I thought the packaging was beautiful. They all have different colours and patterns but all match at the same time.Very tasteful. They give off a vibe of super high quality. 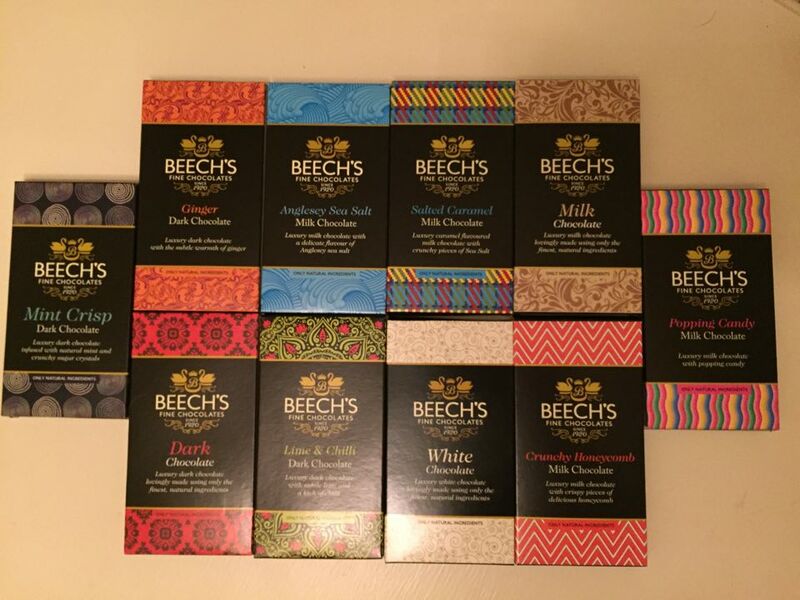 Beechs Fine Chocolates are based in Preston and have been producing high quality, traditional British bars and confectionary since the 1920's. All of their creations are made with raw ingredients, natural colourings and flavourings which I think is a great selling point as it helps the environment. The bars that I were sent can be purchased individually at £1.75 each or a collection of 10 is £15 which is a really good deal. It's not just bars they sell though, there's also Brazils, a vegan range, thins and gift sets. 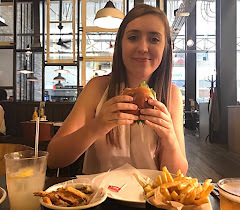 I'm going to go through the flavours that I received in the order that I tried them and let you know what I thought about them, so without further adieu, let's get started! White chocolate is my favourite over milk and dark. I went straight for this as soon as I laid my eyes on it. I wasn't disappointed, it was beautifully creamy with a slight hint of vanilla. It coats your mouth as it melts (in a good way) and didn't last long at all. Dark chocolate isn't my favourite, but I wasn't going to leave them out. Chilli and Lime sounded really intriguing. I've heard of Chilli chocolate before but not with Lime too. It kind of gave off an oriental vibe in my opinion. The smell was immense. You're first hit with a burst of Lime shortly followed by a kick of Chilli. The two favours work really well together and are perfectly balanced. Upon opening the packaging, there's a subtle smell of the mint. It really reminded me of an After Eight. The crunch from the Mint Crisp was very welcome with the smooth chocolate and leaves a pleasant after taste too. Wow! I know popping candy is one of those love it or hate it kind of things, but I'm a lover. As soon as the chocolate hits your mouth, the popping begins. It's a great, fun addition if you're looking for something a little different or quirky. At just 58.9%, I hate to admit it, but it isn't the best dark chocolate I've had. There are better. It was quite dry and very sweet, so you can tell that the cocoa solid isn't as high as you'd expect from a dark chocolate. Not a fan. Not a fan at all. The ginger is far too strong and very overpowering. I think if the flavour was a lot less subtle, there's potential for a lovely tasting bar. However, the amount in this was not good. Before trying, I was expecting this to be like a Crunchie. When I bit into my first chunk, it didn't actually have any honeycomb in so was a little confused. Turns out, the honeycomb is scattered about in little pieces. It didn't contain as much as I'd have hoped but the chunks did tasted great. A lovely crunch with added sweetness. I'm always a little cautious about salted chocolate. If there's too much, it ruins the whole thing. This bar contains the perfect balance and the contrast in flavours tasted so good. They complimented each other very well. My favourite of the lot. Like the previous bar, the salt works great in this chocolate, especially with the addition of the smooth caramel flavouring. I really couldn't get enough of this one, I absolutely loved it. A great simple choice if you're looking for a classic. Although this was a great bar of Milk Chocolate, compared to the other amazing flavours available it just doesn't compare! 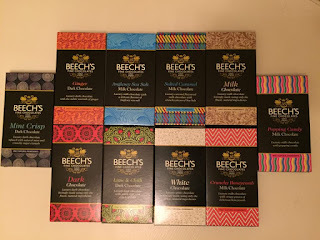 Overall, I was really impressed with the range that Beechs offer. They have some super flavours and something for everyone. You can't tell me there's a flavour there that you wouldn't like!? I would definitely buy these but would stick to the individual bars rather than a pack of 10 as I'd be able to chose my flavours. But the pack of 10 would make a lovely gift for a choccie lover. Thanks for reading. Let me know which flavour you would go for!